OMICRON’s 15 kV testing solution for rotating machines includes the CPC 100 multifunctional testing device, the CP TD15 voltage booster and power/dissipation factor measurement module and the CP CR600 compensating reactor. The CP TD15 combines a high-voltage booster and a high-precision power/dissipation factor measurement module and it generates test voltages of up to 15 kV. The CP CR600 compensating reactor allows users to test rotating machines with high capacitances of up to 1 µF at rated frequency. Together with OMICRON’s CPC 100 multifunctional testing device, the complete 15 kV testing solution can measure electrical parameters, such as insulation capacitance and power/dissipation factor, DC winding resistance and contact resistance. Additionally, the system can also be used for voltage withstand tests and as a high-voltage (HV) source for partial discharge measurements on rotating machines. All of the testing solution components – including the CP TD15, CP CR600 and CPC 100 – are lightweight, fit easily into a car and can be transported and used in the field by a single person. The solution’s compact reactors and integrated HV source replace the need for large and heavy HV source equipment or test trailers. 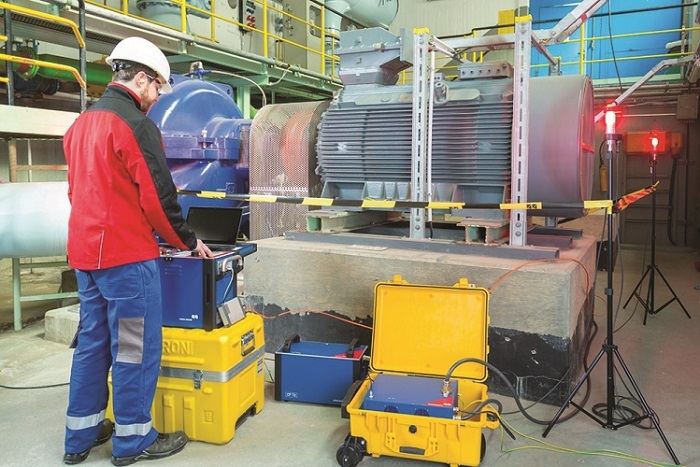 This significantly reduces the measurement setup time and makes the solution ideal for testing rotating machines in power plants and locations that are hard to access, such as crowded industrial environments, ships or wind turbines. Additionally, the solution includes OMICRON’s Primary Test Manager (PTM) software. It provides users with guidance throughout the entire test procedure as well as automated templates to speed up testing and reduce human errors. The software also enables instant measurement analysis with real-time result graphs as well as automated reporting.